Prerak's BLOG: Is Satellite Internet for You? Do you have access to a telephone line or a cable TV line? For those that aren't plugged into these networks, satellite internet is the way to go. Satellite internet delivers internet access through over-the-air satellite waves, and therefore aren't limited by the physical infrastructure the same way DSL, Cable, and even Fiber Optics broadband services are. That means, for those in remote parts of the world, or those that are in a mobile set-up (e.g. mobile home), satellite internet makes plenty of sense. Do you have space for a satellite dish? Sounds obvious, but it's necessary to have space to install an outdoor dish with a clear line-of-sight to the southern sky. If unsure, it might be worth it to consult with a provider's technician on whether your set-up is optimal for satellite service before signing any agreement, especially for multi-story apartment or condominium units. Do you live somewhere with inclement weather? 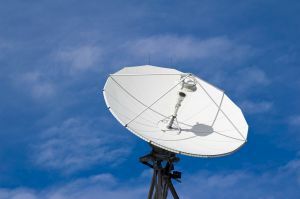 On the flipside, the fact that satellite internet is not tied to a physical infrastructure means its subject to connectivity problems with moisture and precipitation in the atmosphere. Heavy storms may even cause prolonged periods of signal outages. It's, therefore, important to take into consideration the normal weather patterns in and around your area. Is speed a priority? Satellite internet, while considerably faster than traditional dial-up internet, ranges slower in download/upload speeds relative to other broadband solutions. Consumers can typically get 5mbps at the high-end for satellite service. Compare that to 15+mbps for cable, DSL, and fiber optics services. For casual internet users that require internet to email, browse the web, and chat with friends, satellite internet should be sufficient. But for heavier users, online gamers, those that download lots of media or stream video frequently, and business professionals that require VPN or VoIP connections, it might make sense to look elsewhere. Particularly for hard-core gamers, transmission latency in satellite internet might make for a frustrating experience. How much are you willing to spend? With satellite internet access, you get mobility and freedom from physical infrastructures. However, on average, the monthly rate of satellite service per mbps is the most expensive out of all the broadband solutions.